This paper examines the various and problematic definitions of the term ‘authenticity’ with regards to CLIL and mainstream language pedagogy. Using questionnaires, teaching journals and in-class group interviews with students from a variety of different CLIL courses, this paper outlines a small-scale study conducted in Japan to examine CLIL students’ own perceptions of authenticity within language teaching and the relationship between content and authenticity. It also examines the students’ learning aims in an attempt to establish whether there was any preference in terms of content knowledge or language acquisition. Results indicated that, just as CLIL is defined as having ‘dual focused aims’ (Marsh, 2002), the students likewise held both content and language to be equally important. Content was also found to be the most important aspect in defining authenticity. Students expressed dissatisfaction with previous grammar-translation based instruction and advocated a more authentic and content-driven approach to language learning. The term authenticity is used frequently within the burgeoning literature on CLIL practice and research, often being described as a central component to the core of CLIL methodology. In the International Journal of Bilingual Education and Bilingualism, since its initial publication in 1998 there have been seventy-eight issues. A search for the term ‘authentic’ revealed 119 results, meaning authenticity appears on average 1.5 times per issue. In four issues of the International CLIL Research Journal featuring a total of twenty-nine articles, authenticity is mentioned in eleven of those, a total of 37% of all articles. Although the importance of authenticity within CLIL methodology and practice can be established as an integral and in many ways defining aspect, the definition of authenticity itself remains elusive. What exactly is authenticity in the CLIL classroom, and is a separate definition needed from the one used in mainstream EFL pedagogies such as Communicative Language Teaching (CLT) and Task-Based Learning (TBL)? This paper will first establish some of the issues around mainstream definitions of authenticity, the use of the term ‘authenticity’ within the CLIL literature, and then present the findings of a small-scale, preliminary study into Japanese CLIL students’ beliefs about the relationship between authenticity and content in the CLIL classroom. In this paper, when speaking about authenticity I am referring to all of these individual domains of authenticity together in a holistic and inclusive way. Authenticity has been an important aspect in language teaching for many decades. The term ‘authentic’ is often used to describe language learning materials which were not originally designed for that purpose (see for example Little et al., 1989). Therefore authentic materials were usually thought to be texts or samples of language from the target culture which were not designed for learning purposes. This definition is problematic because it depends to some extent on preconceived notions of culture. This definition is no longer adequate in today’s society where many cultures ‘continually influence each other’ (Pavlenko, 2002: 280) in a state of constant interaction and overlap. Authenticity has also been associated with language produced by ‘native speakers’, however, with many nations having adopted a second language as an official language (in many cases, English), this definition fails to reflect the way English is being used around the world. The ‘native speaker’ definition, i.e. that authenticity reflects how L1 speakers use the language, has also lost a lot of ground under the influence of the World Englishes movement, with now more L2 speakers than L1 speakers (Graddol, 1997). Further, these ‘native speaker’ grounded definitions are problematic for CLIL methodology, not just because many of the teachers are L2 speakers (De Graaff et al., 2007) but also due to the nature of CLIL instruction. CLIL emphasises content learning through another language, and that content knowledge is likely universal and not necessarily bound to any one culture. The language produced by native speakers for native speakers in a particular language community. The language produced by a real speaker/writer for a real audience, conveying a real message. The qualities bestowed on a text by the receiver, in that it is not seen as something inherent in a text itself, but is imparted on it by the reader/listener. The types of task chosen. The social situation of the classroom. Assessment [how related the assessment is to the target language use domain]. Culture, and the ability to behave or think like a target language group in order to be recognized and validated by them. Gilmore asks whether the term ought to be abandoned completely as it faces the danger of being ‘too elusive to be useful’ (2007: 98); however, he decides rather to limit the definition to ‘objectifiable criteria.’ For this reason, Gilmore adopts Morrow’s definition, which states that authenticity is ‘real language produced by a real speaker or writer for a real audience and designed to convey a real message’ (1977: 13). While certainly being more useful than the ‘native speaker’ definition, as Gilmore points out, the term ‘real’ opens the concept up so wide as to potentially include classroom discourse, scripted television soap-operas and even interlanguage exchanges between L2 speakers. This leads Gilmore to call for a focus on learning aims ‘rather than chasing our tails in pointless debate over authenticity versus contrivance’ (2007: 98), a useful realignment of the focus. It was for this reason that the present study incorporated students’ learning aims into the research questions. The nature of the CLIL classroom puts the emphasis not on a specific target community where the language is spoken, but on the content being learned using the target language as a tool. CLIL achieves authenticity through ‘authenticity of purpose’ (Coyle et al., 2010: 5). So, in the Vygotskyian (1986) sense that language is a psychological tool through which other forms of learning are mediated, language in CLIL is a tool through which other learning is achieved. Thus the authentic purpose and the learning of meaningful content lend their authenticity to the language; authentic language should arise as a natural by-product of these types of meaningful interaction. However, this type of authenticity could be limited to the discourse in the classroom. For the purpose of improving the delivery and content of CLIL lessons it may be helpful to establish a clearer definition of authenticity that encompasses the materials being used to facilitate these authentic and meaningful interactions, as well as the language produced and the purpose behind the learning. The word content in CLIL is almost synonymous with authenticity. In their table of common reasons for introducing CLIL, Coyle et al. (2010: 17 referring to Marsh et al., 2001) put forward the phrase ‘authentic texts’ as part of the definition of content in CLIL. The term authentic also appears in the definition of the term communication, where ‘language is learned through using it in authentic and unrehearsed yet “scaffolded” situations’ (Coyle, 2006: 13-14). Further, Mehisto et al. (2008: 29) cite authenticity as one of the six core features of CLIL methodology. Mehisto (2012: 50-51) also advocates the use of authentic materials in his Bilingual Education Continuum, which lists ‘authentic materials used in authentic ways and guided communication with L2 speakers’ as indicators of effective practice. Authenticity finds itself being referred to often as a defining aspect of CLIL. Dalton-Puffer (2007) notes that the great advantage afforded by CLIL is that content subjects give rise to ‘real communication’ by tapping into a great reserve of ideas, concepts and meanings allowing for natural use of the TL. It is challenging for language teachers to achieve appropriate levels of authenticity in the classroom. For example, even if ‘authentic’ texts are used, and the subject matter is highly relevant to the lives of the learners, the predominant reasons for these texts being in the lesson remains language learning. For CLIL practitioners and students, it seems that the nature of authenticity does not predominately lie in the source of the text or in the richness of the language. Authenticity within CLIL is more directly associated with purpose, with reasons for engagement. The authentic texts used in a CLIL classroom are not merely collections of vocabulary and grammar from the TL culture, taken out of one context and placed into another for language learning. Authenticity in CLIL is something much bigger, directly related with the student and his or her immediate learning goals. Students use authentic language in the CLIL classroom not because there is an interesting event in current affairs which might stimulate them to communicate for the duration of a single class. Authenticity is directly related to the purpose for being in the classroom, the learning aims and outcomes of the entire curriculum, and more broadly something that will allow learners, hopefully, to take part in the wider discussion as members of a plurilingual society. CLIL aims to go beyond the concept of authenticity as it is used in more traditional language classrooms such as CLT, and certainly beyond more dated approaches such as the grammar-translation method, which is still the predominant approach used by many language teachers in Japan (Lamie, 2001, 2002; Birch, 2011). Contact with speakers of other languages is rather limited in Japan. In such a situation authenticity in language learning, and particularly in CLIL, may have the potential to contribute to improved results in language learning. It is for this reason that the current study was undertaken, in order to gain a better insight into Japanese student’s perception of authenticity and its relationship to classroom content and CLIL-based instruction. In the last two weeks of the spring 2012 semester, I administered questionnaires to students in five CLIL courses which I was teaching at Sophia University, Tokyo, Japan. Classroom journals were also examined and informal group interviews were conducted directly after the questionnaires. The questionnaires collected both qualitative and quantitative data. Previous to this a pilot study was conducted with students at Tokyo University of Foreign Studies (TUFS), who were also enrolled on a CLIL course which I taught (see Table 1 for a summary). How do CLIL students define authenticity? What contributes most to the definition of authenticity? What part does content play in defining authenticity? How are learning aims connected to authenticity? What is the students’ perception of the role of content in CLIL classrooms? What are the students’ main priorities in terms of learning aims – content knowledge or language proficiency? Data was collected from students at Sophia University on various CLIL courses which are taught through English. The courses and students who took part in the study are described in Table 1. Questionnaires, featuring both open (qualitative) and closed (quantitative) questions, were administered in class during the last two weeks of the semester. The question items were given in both English and translations provided in Japanese. Data collection was done in both English and Japanese, with participants having a choice of which language to use. When translating items I consulted with a colleague who is bilingual in both English and Japanese to ensure the accuracy of the translations. All questionnaires were anonymous and participation was optional. In order to validate the data regarding learning aims, the questionnaire used multi-item scales (i.e. asked another similar question, see Dörnyei, 2007: 103-4) which focused on the reason students chose the course. The total number of participants (N) was 103 out of a total of 117 available students. This is because some students were not in attendance when the questionnaire was given, and some students chose not to opt in with the research. In addition to the 103 respondents from Sophia University, the pilot study (N = 10) is also included in the above table for reference, although because the pilot questionnaire administered to this group was re-written before going out to the main group of participants the data collected from the pilot is not included in the quantitative data used in the study. However, as the questionnaire consisted of both qualitative and quantitative data, some of the qualitative data from the pilot was used and will be indicated in the results section. When presenting qualitative data in block quotations, the students class name and row number are indicated parenthetically as a form of identification. In addition to this, I kept a teaching journal based on observations from the class throughout the semester and questions or comments that arose during the administration of the questionnaires. Finally, recorded data from semi-structured group interviews with students after administering the questionnaire was collected. The use of the term ‘real’ is interesting because it relates to Morrow’s (1977) and Gilmore’s (2007) definitions of authenticity, although again this student expressed that he/she found it hard to distinguish. Comments such as this expressed dissatisfaction with the students’ previous learning experience, a dissatisfaction caused by a combination of methodological approach and lack of perceived authenticity. The above comment offers an insight into the way many students experience English in Japan in EFL contexts. Students are often required to meet a certain level of English proficiency as dictated by university entrance examinations. These exams are comprised of a large number of grammar translation items, which can hardly be seen as authentic examples of the language in use. I should note that the student who made the above statement is also training to be a teacher, which is why this student uses some teacher terminology. This student expresses dissatisfaction with his or her previous language learning experience, with special reference to its lack of authentic input or output. Students generally expressed a desire for authentic materials to be incorporated more into language education, with 68% of students stating explicitly that they felt authenticity was a good thing. In summary, the predominant feeling about authenticity was one of confusion and seemed to be connected to the idea of ‘correctness’ or prescriptivism. However, on deeper analysis it emerged that the lack of authenticity in previous language instruction was one of the main causes of dissatisfaction amongst students. Due to the importance of learning aims in defining authenticity (Gilmore, 2007), one of the main questions this study aimed to address was regarding the relationship between authenticity in foreign language acquisition and the teaching of content in CLIL-type classes. Part of the questionnaire focused on learning aims and the reasons students chose the class using a five-item Likert scale (1 = strongly disagree, 2 = disagree, 3 = don’t know, 4 = agree, 5 = strongly agree). A slight preference for language skills can be observed through the average response. However, an interest in the content area was second highest with a difference of only 0.51 between the two. This shows that learning aims featured ‘dual-focused aims’ (Marsh, 2002: 2, emphasis added). Indeed, by comparing modes, content and language learning aims were shown to be identical, both having a most common response rate of 5 – strongly agree. The high score (an average of 3.85) of ‘to learn study skills’ is pertinent (Figure 1). This implies that in addition to having an interest in both content and language learning, most students also want to learn about learning, perhaps indicating an inclination on the part of students to become autonomous, life-long learners. With an average of only 1.7 on the Likert scale accounting for students having indicated no particular learning aims, the most common response being 1 – strongly disagree the majority of students appear to be serious about the classes and their studies. This may indicate their motivation to learn English and echo the reported relationship between authenticity and motivation (Widdowson, 1990; Peacock, 1997; Gilmore, 2007). Only nine respondents indicated ‘other’, amongst which responses were ‘to meet some interesting people who may share the same interests I have’ and ‘I want to get friends who [are] interested in other countries.’ This could be seen as a form of social expansion or a desire for building intercultural relationships. Three out of five of the courses were elective options, so enrolment was not compulsory. For this reason, the two compulsory courses (both part of the English Literature department) are excluded from this data set because the question did not apply. The responses are summarised in Figure 2 below. Again, the average reveals a slight preference for language learning over content, but again the modes reveal an interest in both content and language being evenly matched. Universities in Japan often require a certain number of foreign language credits in order to graduate, although the results indicated that it was not clear to students whether this had influenced their choice to enrol on the course. As can be inferred from the strong weighting given to the content topic of the class, students had a strong interest in the class subject and wanted to learn more about the content area whilst simultaneously improving their language skills. Interestingly, when asked what contributes most to authenticity, the students indicated that content was central to the definition. When asked to choose only one option, 48% of respondents selected content as the main contributing factor to authenticity (see Figure 3). 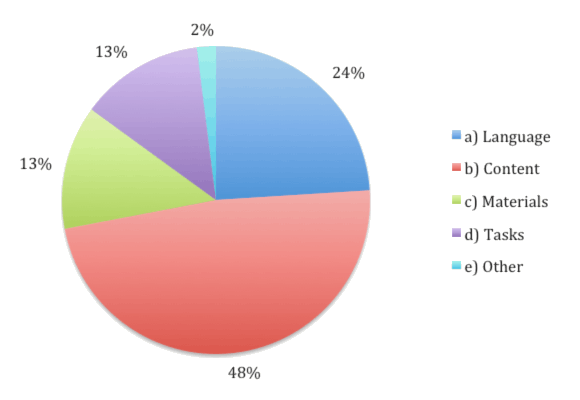 This demonstrates that, although in terms of aims for the class language and content knowledge were close in importance, with language knowledge being slightly more prevalent, in terms of what the students thought made the class authentic, content was reported as the most important factor. Connecting this finding to the previous observation from this study that authenticity, or lack thereof, was a major cause for dissatisfaction in previous language learning environments, it can be inferred that both students and researchers share the idea that authenticity in CLIL is seen as a defining aspect of the approach. This was also supported by qualitative data collected from the students. During the interviews students reported finding it hard to distinguish between content and authenticity, perhaps because the two were interrelated. Further, content was seen as a focal point on which to pin meaning, making the acquisition of the language easier. Three of the students made comments about how content-driven classes using authentic materials allowed for a more dynamic classroom experience, possibly implying a safer learning environment in which scaffolding would be prevalent. However, five students did make it clear that authentic language might be more linguistically complex. Again this comment reinforces the importance of teacher presence and support in scaffolding the classroom learning experience. Although this study reports on a relatively small sample and is preliminary in nature, there are some interesting findings which can be used to further stress the importance of the ‘dual focused aims’ (Marsh, 2002: 2) of the CLIL approach. Students are as keen to learn about content areas as they are to improve their language skills. They are also interested in learning study skills, which perhaps indicates a disposition towards developing greater autonomy. The fact that content was the most important aspect in defining authenticity implies that CLIL, through ‘authenticity of purpose’ delivers a greater sense of engagement to the students and allows opportunities for language focus to arise organically in the classroom situation. This can be defined as authentic communication in the sense that language acquisition arises from language being used as a tool to support other learning. The CLIL classroom, by the very definition of the approach, is authentic in nature, because the CLIL classroom has at its heart learning aims which include authentic interaction and ‘authenticity of purpose’ (Coyle et al., 2010: 5). Although the CLIL students in this study marginally favoured linguistic competence over content knowledge, it was clear that content was almost as important in both the students’ choice of course and learning aims. What is more, the content was vital in defining the nature of the students’ relationship with authenticity. It was the content that held the initial interest for the students and gave them something on which to focus and, in many ways, provided a frame around which language practice could be scaffolded. In this way, authentic content was central to their language learning experience. This is in keeping with the comments I made at the start of this paper that native speaker-based definitions have been out of favour for over a decade. Content and purpose formulated the most important aspects of authenticity for students, and the general satisfaction students expressed and the high value they attributed to content knowledge as part of their learning aims suggests that CLIL has a very valid place in language education in Japan. Future studies might do well to further examine the nature of authenticity within CLIL, and perhaps incorporate teachers’ views on the subject and compare those to views put forward by the students. Birch, G.: 2011, Mandatory in-service training for Japanese teachers of English: a case study, English Language Teacher Education and Development 14,8-14. Coyle, D.: 2006, Developing CLIL: towards a theory of practice, Monograph Barcelona, APAC 6, 5-29. Coyle, D. Hood, P. and Marsh, D.: 2010, Content and Language Integrated Learning, Cambridge University Press, Cambridge. Dalton-Puffer, C.: 2007, Discourse in Content and Language Integrated Learning (CLIL) Classrooms. John Benjamins, Philadelphia, PA.
De Graaff, R. Jan Koopman, G. Anikina, Y. Westhoff, G.: 2007. An observation tool for effective l2 pedagogy in content and language integrated learning (CLIL), International Journal of Bilingual Education and Bilingualism 10/5, 603-624. Dörnyei, Z.: 2007, Research Methods in Applied Linguistics. Oxford University Press, Oxford. Gilmore, A.: 2007, Authentic materials and authenticity in foreign language learning, Language Teaching, 40, 97–118. Graddol, D.: 1997, The Future of English? British Council, London. Lamie, J.: 2001, Understanding Change: The Impact of In-Service Training on Teachers of English in Japan. Nova Science Publishers, Huntington, NY. Lamie, J.: 2002, An Investigation into the process of change: the impact of in-service training on Japanese teachers of English, Journal of In-Service Education, 28/1, 135-162. Little, D., Devitt, S. and Singleton, D.: 1989, Learning Foreign Languages From Authentic Texts: Theory and Practice. Authentik in association with CILT, Dublin. Marsh, D. Maljers, A. and Hartiala, A.K. : 2001, Profiling European CLIL Classrooms. University of Jyväskylä, Jyväskylä. Marsh, D.: 2002, CLIL/EMILE: The European Dimension: Actions, Trends and Foresight Potential. Public Services Contract EG EAC, European Commission, Brussels. Mehisto, P.: 2012, Excellence in Bilingual Education: A Guide for School Principals. Cambridge University Press, Cambridge. Mehisto, P. Marsh, D. and Frigols, M.: 2008, Uncovering CLIL. MacMillan, Oxford. Morrow, K.: 1977, Authentic texts and ESP, in S. Holden (ed. ), English for Specific Purposes, (13–17). Modern English Publications, London. Peacock, M.: 1997, The effect of authentic materials on the motivation of EFL learners, ELT Journal 5/12, 144-156. Pavlenko, A.: 2002, Poststructuralist approaches to the study of social factors in second language learning and use, in V. Cook (ed. ), Portraits of the L2 User, (277 – 302). Multilingual Matters, Clevedon. Vygotsky, L.S. : 1986, Thought and Language. MIT Press, Cambridge, MA. Watanabe, Y.: 1996, Does grammar translation come from the entrance examination? : Preliminary findings from classroom-based research, Language Testing 13/3, 318-333. Widdowson, H.G. : 1990, Aspects of Language Teaching. Oxford University Press, Oxford.